Portrait as Queen of England c. 1472. Queens' College, Cambridge. Elizabeth Woodville (also spelled Wydville, Wydeville, or Widvile[nb 1]) (c. 1437 – 8 June 1492) was Queen consort of England as the spouse of King Edward IV from 1464 until his death in 1483. At the time of her birth, her family was mid-ranked in the English aristocracy; her mother Jacquetta of Luxembourg had previously been an aunt by marriage to Henry VI. Elizabeth's first marriage was to a minor supporter of the House of Lancaster, Sir John Grey of Groby; he died at the Second Battle of St Albans, leaving Elizabeth a widowed mother of two sons. Her second marriage, to Edward IV, was a cause célèbre of the day, thanks to Elizabeth's great beauty and lack of great estates. Edward was the first king of England since the Norman Conquest to marry one of his subjects, and Elizabeth was the first such consort to be crowned queen. [nb 2] Her marriage greatly enriched her siblings and children, but their advancement incurred the hostility of Richard Neville, Earl of Warwick, 'The Kingmaker', and his various alliances with the most senior figures in the increasingly divided royal family. This hostility turned into open discord between King Edward and Warwick, leading to a battle of wills that finally resulted in Warwick switching allegiance to the Lancastrian cause, and to the execution of Elizabeth's father Richard Woodville in 1469. After the death of her husband in 1483 Elizabeth remained politically influential even after her son, briefly proclaimed King Edward V of England, was deposed by her brother-in-law, Richard III. Edward and his younger brother Richard both disappeared soon afterwards and are presumed to have been murdered on Richard's orders. Elizabeth would subsequently play an important role in securing the accession of Henry VII in 1485. Henry married her daughter Elizabeth of York, ended the Wars of the Roses and established the Tudor dynasty. Through her daughter, Elizabeth was the grandmother of the future Henry VIII. Elizabeth was forced to yield pre-eminence to Henry's mother, Lady Margaret Beaufort, and her influence on events in these years, and her eventual departure from court into retirement, remains obscure. Elizabeth Woodville was born about 1437, possibly in October,[nb 3] at Grafton Regis, Northamptonshire. She was the first-born child of a socially unequal marriage between Sir Richard Woodville and Jacquetta of Luxembourg, which briefly scandalised the English court. The Woodvilles, though an old and respectable family, were gentry rather than noble, a landed and wealthy family that had previously produced commissioners of the peace, sheriffs, and MPs rather than peers of the realm; Elizabeth's mother, on the other hand, was the widow of the Duke of Bedford, uncle of King Henry VI of England. In about 1452, Elizabeth Woodville married Sir John Grey of Groby, the heir to the Barony Ferrers of Groby. He was killed at the Second Battle of St Albans in 1461, fighting for the Lancastrian cause. This would become a source of irony, since Elizabeth's future husband Edward IV was the Yorkist claimant to the throne. Elizabeth Woodville's two sons from this first marriage were Thomas (later Marquess of Dorset) and Richard. Elizabeth Woodville was called "the most beautiful woman in the Island of Britain" with "heavy-lidded eyes like those of a dragon." Elizabeth as queen, with Edward and their oldest son. From Dictes and Sayings of the Philosophers, Lambeth Palace. Edward IV had many mistresses, the best known of them being Jane Shore, and he did not have a reputation for fidelity. His marriage to the widowed Elizabeth Woodville took place secretly and, though the date is not known, it is traditionally said to have taken place at her family home in Northamptonshire on 1 May 1464. Only the bride's mother and two ladies were in attendance. Edward married her just over three years after he had assumed the English throne in the wake of his overwhelming victory over the Lancastrians at the Battle of Towton, which resulted in the displacement of King Henry VI. Elizabeth Woodville was crowned queen on 26 May 1465, the Sunday after Ascension Day. In the early years of his reign, Edward IV's governance of England was dependent upon a small circle of supporters, most notably his cousin, Richard Neville, Earl of Warwick. At around the time of Edward IV's secret marriage, Warwick was negotiating an alliance with France in an effort to thwart a similar arrangement being made by his sworn enemy Margaret of Anjou, wife of the deposed Henry VI. The plan was that Edward IV should marry a French princess. When his marriage to Elizabeth Woodville, who was both a commoner and from a family of Lancastrian supporters, became public, Warwick was both embarrassed and offended, and his relationship with Edward IV never recovered. The match was also badly received by the Privy Council, who according to Jean de Waurin told Edward with great frankness that "he must know that she was no wife for a prince such as himself". With the arrival on the scene of the new queen came many relatives, some of whom married into the most notable families in England. Three of her sisters married the sons of the earls of Kent, Essex and Pembroke. Another sister, Catherine Woodville, married the queen's 11-year-old ward Henry Stafford, 2nd Duke of Buckingham, who later joined Edward IV's brother Richard, Duke of Gloucester, in opposition to the Woodvilles after the death of Edward IV. Elizabeth's 20-year-old brother John married Katherine, Duchess of Norfolk. The Duchess had been widowed three times and was probably in her sixties, which created a scandal at court. Elizabeth's son from her first marriage, Thomas Grey, married Cecily Bonville, 7th Baroness Harington. When Elizabeth Woodville's relatives, especially her brother Anthony Woodville, 2nd Earl Rivers, began to challenge Warwick's pre-eminence in English political society, Warwick conspired with his son-in-law George, Duke of Clarence, the king's younger brother. One of his followers accused Elizabeth Woodville's mother, Jacquetta of Luxembourg, of practising witchcraft. She was acquitted the following year. Warwick and Clarence twice rose in revolt and then fled to France. Warwick formed an uneasy alliance with the Lancastrian Queen Margaret of Anjou and restored her husband Henry VI to the throne in 1470, but, the following year, Edward IV returned from exile and defeated Warwick at the Battle of Barnet and the Lancastrians at the Battle of Tewkesbury. Henry VI was killed soon afterwards. Following her husband's temporary fall from power, Elizabeth Woodville sought sanctuary in Westminster Abbey, where she gave birth to a son, Edward (later King Edward V of England). Her marriage to Edward IV produced a total of ten children, including another son, Richard, Duke of York, who would later join his brother as one of the Princes in the Tower. Five daughters also lived to adulthood. Elizabeth Woodville engaged in acts of Christian piety in keeping with conventional expectations of a medieval queen consort. Her acts included making pilgrimages, obtaining a papal indulgence for those who knelt and said the Angelus three times per day, and founding the chapel of St. Erasmus in Westminster Abbey. Following Edward IV's sudden death, possibly from pneumonia, in April 1483, Elizabeth Woodville became queen dowager. Her young son, Edward V, became king, with his uncle, Richard, Duke of Gloucester, acting as Lord Protector. In response to the Woodvilles' attempt to monopolise power, Gloucester quickly moved to take control of the young king and had Anthony Woodville, 2nd Earl Rivers, and Richard Grey, brother and son to Elizabeth, arrested. The young king was transferred to the Tower of London to await the coronation. With her younger son and daughters, Elizabeth again sought sanctuary. Lord Hastings, the late king's leading supporter in London, initially endorsed Gloucester's actions, but Gloucester then accused him of conspiring with Elizabeth Woodville against him. Hastings was summarily executed. Whether any such conspiracy really occurred is not known. Richard accused Elizabeth of plotting to "murder and utterly destroy" him. On 25 June 1483 Gloucester had Elizabeth Woodville's son and brother executed in Pontefract Castle, Yorkshire. By an act of Parliament, the Titulus Regius (1 Ric. 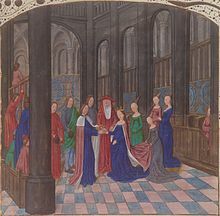 III), it was declared that Edward IV's children with Elizabeth illegitimate on the grounds that Edward IV had a precontract with the widow Lady Eleanor Butler, which was considered a legally binding contract that rendered any other marriage contract invalid. One source, the Burgundian chronicler Philippe de Commines, says that Robert Stillington, Bishop of Bath and Wells, carried out an engagement ceremony between Edward IV and Lady Eleanor. The act also contained charges of witchcraft against Elizabeth, but gave no details and had no further repercussions. As a consequence, the Duke of Gloucester and Lord Protector was offered the throne and became King Richard III. Edward V, who was no longer king, and his brother Richard, Duke of York, remained in the Tower of London. There are no recorded sightings of them after the summer of 1483. Now referred to as Dame Elizabeth Grey, she and the Duke of Buckingham (a former close ally of Richard III and now probably seeking the throne for himself) now allied themselves with Lady Margaret Stanley (née Beaufort) and espoused the cause of Margaret's son Henry Tudor, a great-great-great-grandson of King Edward III, the closest male heir of the Lancastrian claim to the throne with any degree of validity. [nb 4] To strengthen his claim and unite the two feuding noble houses, Elizabeth Woodville and Margaret Beaufort agreed that the latter's son should marry the former's eldest daughter, Elizabeth of York, who upon the death of her brothers became the heiress of the House of York. Henry Tudor agreed to this plan and in December 1483 publicly swore an oath to that effect in the cathedral in Rennes, France. A month earlier, an uprising in his favour, led by Buckingham, had been crushed. Richard III's first Parliament of January 1484 stripped Elizabeth of all the lands given to her during Edward IV's reign. On 1 March 1484, Elizabeth and her daughters came out of sanctuary after Richard III publicly swore an oath that her daughters would not be harmed or molested and that they would not be imprisoned in the Tower of London or in any other prison. He also promised to provide them with marriage portions and to marry them to "gentlemen born". The family returned to Court, apparently reconciled to Richard III. After the death of Richard III's wife Anne Neville in March 1485, rumours arose that the newly widowed king was going to marry his beautiful and young niece Elizabeth of York. In 1485, Henry Tudor invaded England and defeated Richard III at the Battle of Bosworth Field. As King, Henry VII married Elizabeth of York and had the Titulus Regius revoked and all found copies destroyed. Elizabeth Woodville was accorded the title and honours of a queen dowager. Scholars differ about why Dowager Queen Elizabeth spent the last five years of her life living at Bermondsey Abbey, to which she retired on 12 February 1487. Among her modern biographers, David Baldwin believes that Henry VII forced her retreat from the Court, while Arlene Okerlund presents evidence from July 1486 that she was already planning her retirement from court to live a religious, contemplative life at Bermondsey Abbey. Another suggestion is that her retreat to Bermondsey was forced on her because she was in some way involved in the 1487 Yorkist rebellion of Lambert Simnel, or at least was seen as a potential ally of the rebels. At Bermondsey Abbey, Elizabeth was treated with the respect due to a dowager queen; she lived a regal life on a pension of £400 and received small gifts from Henry VII. She was present at the birth of her granddaughter Margaret at Westminster Palace in November 1489 and at the birth of her grandson, the future Henry VIII, at Greenwich Palace in June 1491. Her daughter Queen Elizabeth visited her on occasion at Bermondsey, although another one of her other daughters, Cecily of York, visited her more often. Henry VII briefly contemplated marrying his mother-in-law to King James III of Scotland, when James III's wife, Margaret of Denmark, died in 1486. However James III was killed in battle in 1488. Elizabeth Woodville died at Bermondsey Abbey on 8 June 1492. With the exception of the queen, who was awaiting the birth of her fourth child, and Cecily of York, her daughters attended the funeral at Windsor Castle: Anne of York (the future wife of Thomas Howard), Catherine of York (the future Countess of Devon) and Bridget of York (a nun at Dartford Priory). Elizabeth's will specified a simple ceremony. The surviving accounts of her funeral on 12 June 1492 suggest that at least one source "clearly felt that a queen's funeral should have been more splendid" and may have objected that "Henry VII had not seen fit to arrange a more queenly funeral for his mother-in-law", despite the fact that the simplicity was the queen dowager's own wish. Elizabeth was laid to rest in the same chantry as her husband King Edward IV in St George's Chapel in Windsor Castle. Thomas Grey, Earl of Huntingdon, Marquess of Dorset and Lord Ferrers de Groby (1455 – 20 September 1501), married firstly Anne Holland, but she died young without issue; he married secondly on 18 July 1474, Cecily Bonville, suo jure Baroness Harington and Bonville, by whom he had fourteen children. The disputed queen Lady Jane Grey is a direct descendant from this line. Richard Grey (1457 – 25 June 1483) was executed at Pontefract Castle. Elizabeth of York (11 February 1466 – 11 February 1503), Queen consort of England as the wife of Henry VII (reigned 1485–1509), whose marriage united the Houses of York and Lancaster and helped to bring permanent closure to the Wars of the Roses. Mother of Henry VIII (reigned 1509–1547). Edward IV's love for his wife is celebrated in sonnet 75 of Philip Sidney's Astrophel and Stella. (written by 1586, first pub. 1591). She appears in two of Shakespeare's plays: Henry VI Part 3 (written by 1592), in which she is a fairly minor character, and Richard III (written approx. 1592), where she has a central role. Shakespeare portrays Elizabeth as a proud and alluring woman in Henry VI Part 3. By Richard III, she is careworn from having to defend herself against detractors in the court, including her titular brother-in-law Richard. She is one of Richard's cleverest opponents, as she sees through him from the beginning, but she is also melodramatic and self-pitying. Although most modern editions of Henry VI Part 3 and Richard III call her "Queen Elizabeth" in the stage directions, the original Shakespearean Folio never actually refer to her by name, instead calling her first "Lady Grey" and later simply "Queen." The Last of the Barons by Edward Bulwer-Lytton Available online. Dickon (1929) by Marjorie Bowen. The Daughter of Time (1951), Josephine Tey's classic mystery. The White Rose (1969) by Jan Westcott. The King's Grey Mare (1972) by Rosemary Hawley Jarman, a fictionalised biography of Elizabeth Woodville. The Woodville Wench (published in US as The Queen Who Never Was) (1972) by Maureen Peters. The Four Queens (1977) (also known as The Royal Consorts (1978) or Queen's Ransom (1986)) by Anne Powers, which links Elizabeth Woodville's life with those of Margaret of Anjou, Anne Neville and Elizabeth of York. The Sunne in Splendour (1982) by Sharon Kay Penman. The Sun in Splendour (1982) by Jean Plaidy. A Secret Alchemy (2009) by Emma Darwin. The White Queen (2009) by Philippa Gregory, which borrows Rosemary Hawley Jarman's supernatural elements from The King's Grey Mare. Elizabeth Woodville also appears in other novels in Gregory's Cousins' War series. The King's Grace (2009) by Anne Easter Smith The life of Edward IV's illegitimate daughter who spent many years in service of the Dowager Queen. Das Spiel der Könige, a historical novel in German by Rebecca Gablé. The Golden Widows (2014) by Isolde Martyn. Richard III (1912): Woodville was played by Carey Lee. In the French film, Les enfants d'Édouard (1914), Woodville was played by Jeanne Delvair. Jane Shore (1915): Woodville was played by Maud Yates. Tower of London (1939): Woodville was played by Barbara O'Neil. Richard III (1955): Woodville was portrayed by Mary Kerridge. In the Hungarian TV movie III. Richárd (1973) Woodville was played by Rita Békés. Richard III (1995): Woodville was played by Annette Bening. Looking For Richard (1996): Woodville was played by Penelope Allen. Richard III (2005): Woodville was played by Caroline Burns Cooke. Richard III (2008): Woodville was played by María Conchita Alonso. An Age of Kings (1960): Woodville was portrayed by Jane Wenham. Wars of the Roses (1965): Woodville was played by Susan Engel. The Third Part of Henry the Sixth and The Tragedy of Richard III (1983): Woodville was played by Rowena Cooper. The White Queen (2013): Woodville was portrayed by Rebecca Ferguson. The Hollow Crown, Henry VI and Richard III (2016): Woodville was played by Keeley Hawes. The White Princess (2017): Woodville was played by Essie Davis. Elizabeth Woodville Primary School, Groby, Leicestershire (1971). Elizabeth Woodville Secondary School, Roade, Northamptonshire (2011). Dexter, a lion argent. Sinister, a greyhound argent collared gules. ^ Although spelling of the family name is usually modernised to "Woodville", it was spelled "Wydeville" in contemporary publications by Caxton and her tomb at St George's Chapel, Windsor Castle is inscribed thus; "Edward IV and his Queen Elizabeth Widvile". ^ John's marriage to Isabel of Gloucester was annulled shortly after his accession, and she was never crowned; Henry IV's first wife Mary de Bohun died before he became king. ^ Henry Tudor's claim to the throne was weak due to a declaration of Henry IV that barred the accession to the throne of any heirs of the legitimised offspring of his father John of Gaunt by his third wife Katherine Swynford. The original act legitimizing the children of John of Gaunt and Katherine Swynford passed by Parliament and the bull issued by the Pope in the matter legitimised them fully, which made the legality of Henry IV's declaration questionable. ^ "Women in Medieval England". google.co.uk. ^ Robert Fabian, The New Chronicles of England and France, ed. Henry Ellis (London: Rivington, 1811), 654; "Hearne’s Fragment of an Old Chronicle, from 1460–1470," The Chronicles of the White Rose of York. (London: James Bohn, 1845), 15–16. ^ Calendar of Patent Rolls, 1467–77, pg. 190. ^ Sutton and Visser-Fuchs, "A 'Most Benevolent Queen;'"Laynesmith, pp. 111, 118–19. ^ C. T. Wood, "Richard III, William, Lord Hastings and Friday the Thirteenth", in R. A. Griffiths and J. Sherborne (eds. ), Kings and Nobles in the Later Middle Ages, New York, 1986, 156–61. ^ Charles Ross, Richard III, University of California Press, 1981 p81. ^ Philipe de Commines, The memoirs of Philip de Commines, lord of Argenton, Volume 1, H.G. Bohn, 1855, pp.396–7. ^ Genealogical Tables in Morgan, (1988), p. 709. ^ "Parliamentary Rolls Richard III". Rotuli Parliamentorum A.D. 1483 1 Richard III Cap XV. ^ "Rotuli Parliamentorum A.D. 1485 1 Henry VII – Annullment of Richard III's Titulus Regius". 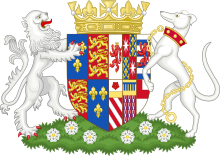 ^ "Rotuli Parliamentorum A.D. 1485 1 Henry VII – Restitution of Elizabeth Queen of Edward IV". ^ Arlene Okerlund, Elizabeth: England's Slandered Queen. Stroud: Tempus, 2006, 245. ^ Bennett, Michael, Lambert Simnel and the Battle of Stoke, New York, St. Martin's Press, 1987, pp.42; 51; Elston, Timothy, "Widowed Princess or Neglected Queen" in Levin & Bucholz (eds), Queens and Power in Medieval and Early Modern England, University of Nebraska Press, 2009, p.19. ^ Breverton, Terry (15 May 2016). Henry VII: The Maligned Tudor King. Amberley Publishing Limited. ISBN 9781445646060. ^ "Margaret of Denmark Facts, information, pictures". Encyclopedia.com. Retrieved 5 September 2016. ^ a b J. L. Laynesmith, The Last Medieval Queens: English Queenship 1445–1503, Oxford University Press, New York, 2004, pp.127–8. ^ "Astrophel and Stella: 75". utoronto.ca. ^ "Elizabeth Woodville Primary School". Elizabethwoodvilleprimaryschool.co.uk. Retrieved 5 September 2016. ^ "The Elizabeth Woodville School". Ewsacademy.org. Retrieved 5 September 2016. ^ Boutell, Charles (1863). "A Manual of Heraldry, Historical and Popular". London: Winsor & Newton: 277. Anne Sutton and Livia Visser-Fuchs, "'A Most Benevolent Queen': Queen Elizabeth Woodville's Reputation, Her Piety, and Her Books", The Ricardian, X:129, June 1995. PP. 214–245. Wikimedia Commons has media related to Elizabeth Woodville.